Lassa fever is an acute viral illness that occurs in West Africa. The illness was discovered in 1969 when two missionary nurses died in Nigeria. The cause of the illness was found to be Lassa virus, named after the town where the first cases originated. The virus, a member of the virus family Arenaviridae, is a single-stranded RNA virus and is zoonotic, or animal-borne. In areas of Africa where the disease is endemic, Lassa fever is a significant cause of morbidity and mortality. While Lassa fever is mild or has no observable symptoms in about 80% of people infected with the virus, the remaining 20% have a severe multisystem disease. Lassa fever is also associated with occasional epidemics, during which the case-fatality rate can reach 50%. WHERE IS LASSA FEVER FOUND? Lassa fever is an endemic disease in portions of West Africa. It is recognized in Guinea, Liberia, Sierra Leone, as well as Nigeria. However, because the rodent species which carry the virus are found throughout West Africa, the actual geographic range of the disease may extend to other countries in the region. HOW MANY PEOPLE BECOME INFECTED? The number of Lassa virus infections per year in West Africa is estimated at 100,000 to 300,000, with approximately 5,000 deaths. Unfortunately, such estimates are crude, because surveillance for cases of the disease is not uniformly performed. In some areas of Sierra Leone and Liberia, it is known that 10%-16% of people admitted to hospitals have Lassa fever, which indicates the serious impact of the disease on the population of this region. IN WHAT ANIMAL HOST IS LASSA VIRUS MAINTAINED? The reservoir, or host, of Lassa virus is a rodent known as the “multimammate rat” of the genus Mastomys. It is not certain which species of Mastomys are associated with Lassa; however, at least two species carry the virus in Sierra Leone. Mastomys rodents breed very frequently, produce large numbers of offspring, and are numerous in the savannas and forests of West, Central, and East Africa. In addition, Mastomys generally readily colonize human homes. All these factors together contribute to the relatively efficient spread of Lassa virus from infected rodents to humans. HOW DO HUMANS GET LASSA FEVER? There are a number of ways in which the virus may be transmitted, or spread, to humans. The Mastomys rodents shed the virus in urine and droppings. Therefore, the virus can be transmitted through direct contact with these materials, through touching objects or eating food contaminated with these materials, or through cuts or sores. Because Mastomys rodents often live in and around homes and scavenge on human food remains or poorly stored food, transmission of this sort is common. Contact with the virus also may occur when a person inhales tiny particles in the air contaminated with rodent excretions. This is called aerosol or airborne transmission. Finally, because Mastomys rodents are sometimes consumed as a food source, infection may occur via direct contact when they are caught and prepared for food. Lassa fever may also spread through person-to-person contact. This type of transmission occurs when a person comes into contact with virus in the blood, tissue, secretions, or excretions of an individual infected with the Lassa virus. The virus cannot be spread through casual contact (including skin-to-skin contact without exchange of body fluids). Person-to-person transmission is common in both village and health care settings, where, along with the above-mentioned modes of transmission, the virus also may be spread in contaminated medical equipment, such as reused needles (this is called nosocomial transmission). WHAT ARE THE SYMPTOMS OF LASSA FEVER? Signs and symptoms of Lassa fever typically occur 1-3 weeks after the patient comes into contact with the virus. 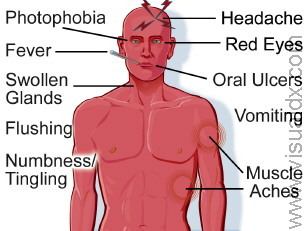 These include fever, retrosternal pain (pain behind the chest wall), sore throat, back pain, cough, abdominal pain, vomiting, diarrhea, conjunctivitis, facial swelling, proteinuria (protein in the urine), and mucosal bleeding. Neurological problems have also been described, including hearing loss, tremors, and encephalitis. Because the symptoms of Lassa fever are so varied and nonspecific, clinical diagnosis is often difficult. HOW IS THE DISEASE DIAGNOSED IN THE LABORATORY? Lassa fever is most often diagnosed by using enzyme-linked immunosorbent serologic assays (ELISA), which detect IgM and IgG antibodies as well as Lassa antigen. The virus itself may be cultured in 7 to 10 days. Immunohistochemistry performed on tissue specimens can be used to make a post-mortem diagnosis. The virus can also be detected by reverse transcription-polymerase chain reaction (RT-PCR); however, this method is primarily a research tool. ARE THERE COMPLICATIONS AFTER RECOVERY? The most common complication of Lassa fever is deafness. Various degrees of deafness occur in approximately one-third of cases, and in many cases hearing loss is permanent. As far as is known, severity of the disease does not affect this complication: deafness may develop in mild as well as in severe cases. Spontaneous abortion is another serious complication. WHAT PROPORTION OF PEOPLE DIE FROM THE ILLNESS? Approximately 15%-20% of patients hospitalized for Lassa fever die from the illness. However, overall only about 1% of infections with Lassa virus result in death. The death rates are particularly high for women in the third trimester of pregnancy, and for fetuses, about 95% of which die in the uterus of infected pregnant mothers. HOW IS LASSA FEVER TREATED? Ribavirin, an antiviral drug, has been used with success in Lassa fever patients. It has been shown to be most effective when given early in the course of the illness. Patients should also receive supportive care consisting of maintenance of appropriate fluid and electrolyte balance, oxygenation and blood pressure, as well as treatment of any other complicating infections. WHAT GROUPS ARE AT RISK FOR GETTING THE ILLNESS? Individuals at risk are those who live or visit areas with a high population of Mastomys rodents infected with Lassa virus or are exposed to infected humans. Hospital staff are not at great risk for infection as long as protective measures are taken. HOW IS LASSA FEVER PREVENTED? 1. Avoid crowded areas and limit your trips to local markets. 2. Wash your hands often. 3. Avoid touching your nose, eyes or mouth with unwashed hands when in public places. 4. Keep all garbage bins covered and regularly emptied. 5. Avoid leaving leftover food/fruits/veggies in garden or out of doors. 6. Fumigate outside areas with rat poison regularly, where possible. 7. Unfortunately there is no vaccine for Lassa fever.